Michigan will play Notre Dame for the first time since 2014 on September 1, renewing a rivalry between two of the winningest programs in college football. Wolverines head coach Jim Harbaugh, who played in two games against the Fighting Irish as a player, said any continuation of the series against Notre Dame will come down to whether or not the two programs are willing to schedule more games. “It’s one of those things where both parties are willing to put it on their schedule,” Harbaugh said. MILWAUKEE – He doesn’t make outlandish guarantees, but it’s easy to see that two-time Olympian Mitchell Whitmore isn’t short on confidence. Asked about his expectations for the 2018 Winter Games, Whitmore, who trained at the Northbrook Speed Skating Club, showcases more bravado than his fellow speed- skating Olympians. “I think I have a chance to win a medal this time around,” Whitmore last week said about his Olympic expectations. Whitmore, a Waukesha, Wisconsin, native, pointed to his improved 2017-2018 World Cup performances to support his confidence. According to International Skating Union, Whitmore improved his 500-meter race from a 16th-place finish in Heerenveen, Netherlands on November 12, to a 3rd-place finish in Calgary on December 3. These World Cup performances came against most of the skaters Team USA will face in Pyeongchang. This includes Netherlands skater, and medal favorite, Ronald Mulder, whom Whitmore sees as a main competitor in the oval. “I really enjoy when I’m ahead of him,” Whitmore said. 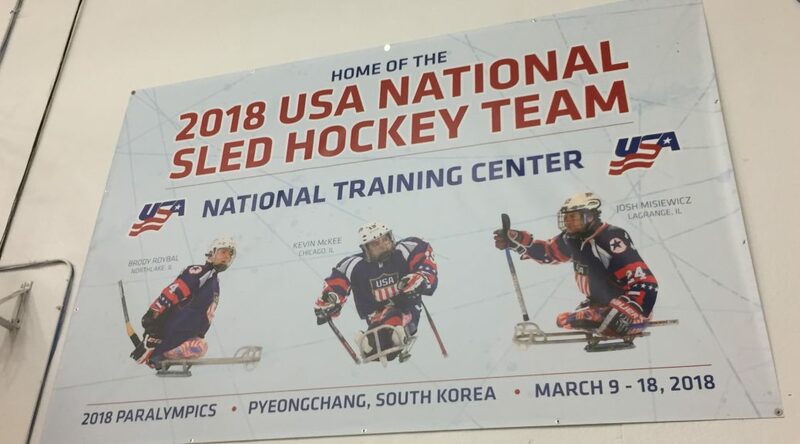 U.S. All-round Long Track team head coach Tom Cushman echoed Whitmore’s confidence, saying he has a “very good” chance to medaling in South Korea. “He just set the track record in Milwaukee,” Cushman said. Despite not being a medal favorite on paper, Whitmore’s 2017-2018 World Cup finishes have given him a confidence boost heading into the Games. “I didn’t expect a lot, but I had a couple placings higher than what I was expecting,” Whitmore said. Asked a similar question, two of Whitmore’s counterparts, three-time Olympian Brian Hansen and two-time Olympian Emery Lehman, shied away from swaggering statements. Hansen, who owns a silver medal from the 2010 Olympic games, said it wasn’t too crazy to think he could medal, but had tamer expectations overall. Lehman also stayed away from the idea of great Olympic expectations. Whitmore improvement and bravado could prove to be the missing pieces, as he said he wasn’t medal threat in 2014. “I’m just an overall better skater now,” Whitmore said. Three of the four members on the U.S. Olympic ski-jumping team hail from Illinois’ lone ski-jumping club, and have made history for their training club in the process. U.S. Ski and Snowboard announced on January 25 Wauconda’s Kevin Bickner and Barrington’s Casey Larson will join Cary’s Michael Glasder on the 2018 Olympic team, marking the first ski jumpers from the northwest-suburban Norge Ski Club to make the Olympics. Park City, Utah, native Will Rhoads was the fourth and final ski jumper to make the Olympic team.